Verona Reserve a gated community located within the southwest quadrant of Jacaranda Boulevard and East Venice Avenue. 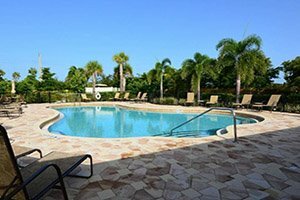 The commercial hub of Jacaranda Commons is wedged adjacent to the northeastern side of this community which promotes some of the ideal picks for Sarasota homes for sale. Verona Reserve’s gate is on Jacaranda Boulevard, abutting the retail center. This entrance/exit to the community is only about a quarter mile south of the East Venice Avenue‒Jacaranda roundabout and a mile from Interstate 75 in the north. Verona Reserve is a residential development of national homebuilder Taylor Morrison which opened it in early 2011. This community counts amongst the housing projects which proliferated in and around Sarasota County following the U.S. economic rebound after the Great Recession. Taylor Morrison set the acreage of Verona Reserve for 60 single-family homes plus 105 villas constructed two per building. These residential lots were platted either next to a community water feature or the property’s hammock preserve. Verona Reserve homes for sale draw buyers with their superior construction to the builds of the multi-awarded Taylor Morrison. One of the villa designs in this community, the Ibis, notably bagged the best overall award in its category in the 2011 Sarasota-‒Manatee Parade of Homes. Verona Reserve is a maintenance-included community, with the cost of the upkeep of common areas, landscaping and home exteriors covered by the low HOA fees homeowners pay. The HOA fee for villas also covers insurance of exteriors including paint, roof and window panes as well regular pressure cleaning of driveways and pest control. 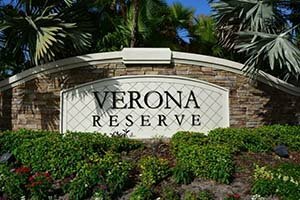 Verona Reserve is an eco-friendly development with reclaimed water used in lawn irrigation. Bike use amongst residents is encouraged with the installation of bicycle parking racks in strategic locations within the community. Built out in 2013, this development also features a pool with a cabana. Other amenities in Verona Reserve likewise include a fenced-in dog park with benches and sidewalk. An old-style red fire hydrant is the centerpiece of this dog park which also welcomes other pets provided they’re on leash. House hunters would be glad to note that Verona Reserve has no CDD fees. Prospective buyers who prefer single family homes could find in this community choices from Taylor Morrison’s Fairmont and Pinehurst designs featuring floor plans of between 1,768 and 2,055 square feet good for three bedrooms and two bathrooms. A larger option, the Elmhurst floor plan, provides four bedrooms and three bathrooms within its floor area of 2,329 square feet. Resale pricing of these Taylor Morrison single-family home builds ranges between the $300s and the $400s. The asking prices on the Taylor Morrison twin villas in Verona Reserve, on the other hand, are typically quoted in the $200s. These residences provide a floor area of 1,533 square feet designed with two bedrooms and two bathrooms. Many families have chosen to move to Verona Reserve because of its proximity to local amenities including a Publix supermarket and CVS drug store within walking distance. A country club offering affordable membership, the Pelican Golf & Country Club, is also nearby along with easily accessible schools like Taylor Ranch Elementary, Venice Senior High and Venice Area Middle. 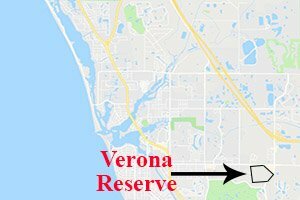 Below are the current real estate listings available in Verona Reserve.